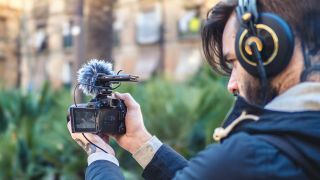 As any videographer will tell you, audio quality is paramount for high-quality video. While many visual missteps can be easily forgiven, poor-quality sound is perhaps the most obvious way in which otherwise-professional footage is dragged down. Your camera’s built-in microphones are designed for convenience rather than quality, and will only get you so far, but the solution is neither cumbersome nor costly. The Olympus LS-P4 is designed for high-quality, dynamic recording, and it’s one of the first linear PCM recorders to record in the FLAC format. Recording in Hi-Res 96kHz 24-bit audio, the LS-P4 produces files FLAC that are up to 30% smaller than PCM WAV files, but still of a standard that surpasses CD quality. Once you’ve captured your audio, you can play it back in high quality whatever format you’ve chosen to capture in. The triple microphone design not only allows you to capture more dynamic bass, but also allows you to alternate between capturing sound directionally and across a wide area. These also make noise reduction possible, suppressing unwanted ambient sounds to help whatever you’re recording stand out. The microphones’ zooming feature cleverly lets you flip between capturing more distant sounds and close-up conversations, and together with a frequency of 20Hz-44,000Hz and seven different sample rates to choose from, you can be sure to capture what you want, exactly how you want it. The LS-P4 is further bolstered by additional features that will help you achieve professional recordings. You can overdub multiple tracks into one, trim recordings, and fade in and out the start and end of recordings to make them flow naturally into each other and reduce any clicking noises. Under-recorded audio can also be quickly normalised to bring its balance back to the right level, while the Limiter feature can be used to suppress clipping by compressing the peak level of any sounds that surpass the recording level. Despite its metal build, the LS-P4 weighs just 75g and measures 14.4mm thick. It can be easily operated with just one hand, although it also happily slips into your camera’s hotshoe. You can even hook it up to an Android smartphone and control it remotely via Bluetooth if it's more convenient to do so. Operation is simplified with the 1.43in LCD screen, which boasts a backlit LED for use in darker conditions, although large, tactile buttons and a Voice Guidance feature that dictates menu options allow you to operate it blind. The LS-P4 will last for up to 39 hours per charge, and with the clever incorporation of a USB adapter right into the base of the unit, you can charge it and transfer its contents without any cables. It’s also furnished with a generous 8GB of internal memory, although you can expand this to 32GB through the microSDHC port should you need to. Whether you’re blogging or vlogging, recording professional video or simply recording an interview, the LS-P4 will elevate your sound to new levels.